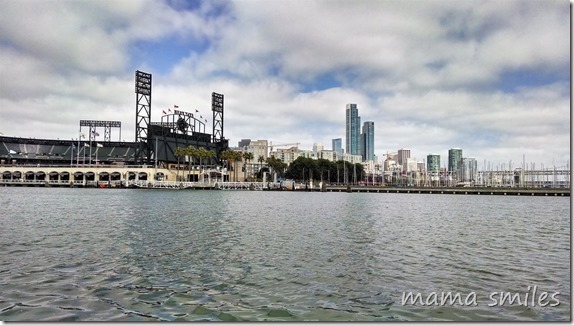 San Francisco with Kids: Ride the Ducks! 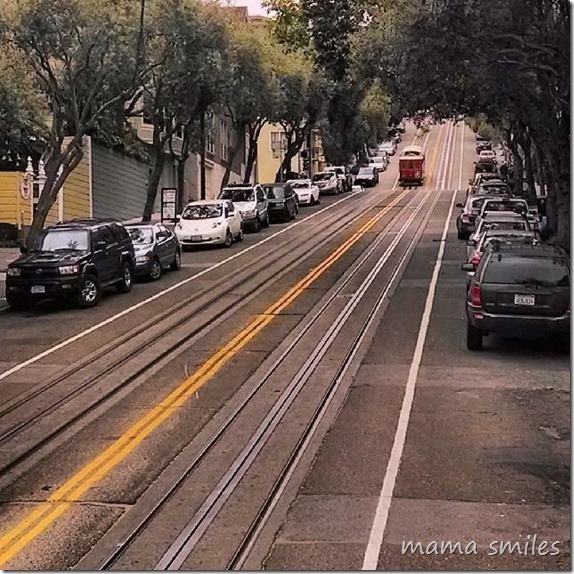 Have you ever been to San Francisco? Driving across the Golden Gate Bridge is one of my earliest childhood memories – from when I was four years old! Last weekend we had the opportunity to tour the city with Ride the Ducks, and it was the perfect way to tour San Francisco with kids! Here are a few of our favorite parts of the tour! San Francisco is an incredible city! I knew I wanted to take the kids to see it, but wasn’t sure where to start. 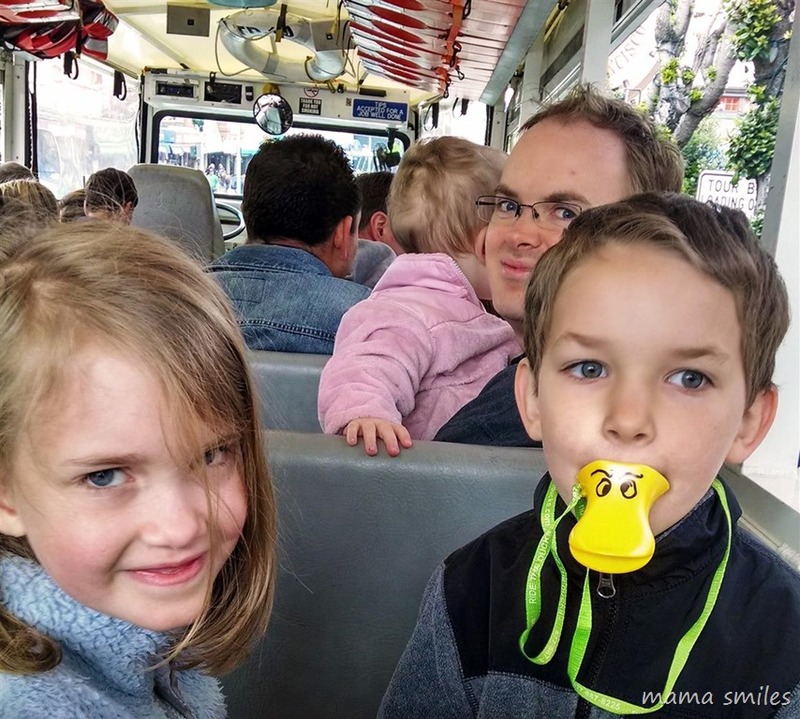 When we were offered the chance to ride Ride the Ducks (tour the city on WWII era DUKW amphibious vehicles), I knew I had found the perfect introduction to the city for my kids! 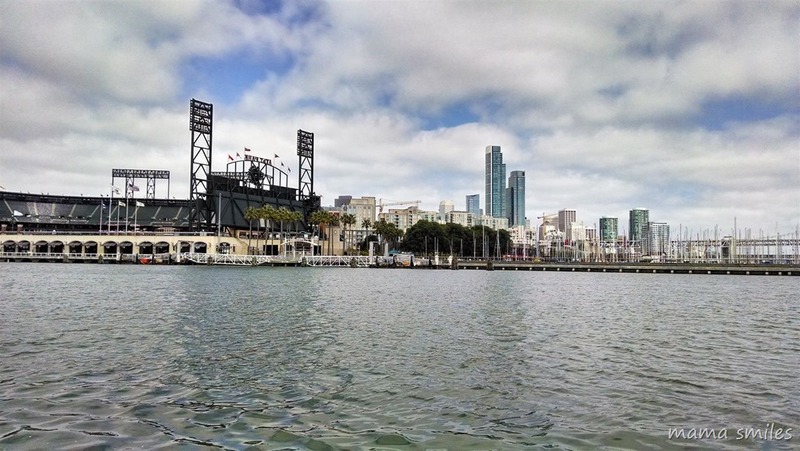 Our first attempt was rained out, but I’m glad we waited because we got PERFECT weather for our day out in the city – and touring it from inside the bay is the perfect introduction to the city! See the Giants AT&T Stadium on the left? People go out on the bay in all sorts of boats during games, hoping to catch balls that get hit out of the stadium! Kids are always given the opportunity to “drive” the DUKW while it’s in the water. My kids were too shy, but the kids who gave it a go had a blast! Sea lions are one of my favorite things to find in San Francisco! 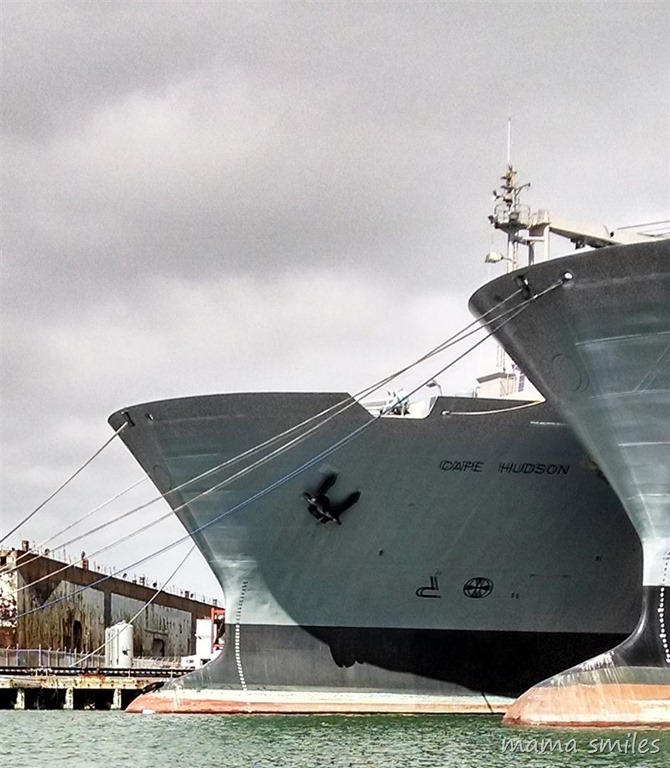 Can you spot one sunbathing at the bottom of the Cape Hudson boat? We spotted a few others that were jumping in and out of the water, but they were too far away to capture with my little phone camera. Next time I’ll bring my DSLR! 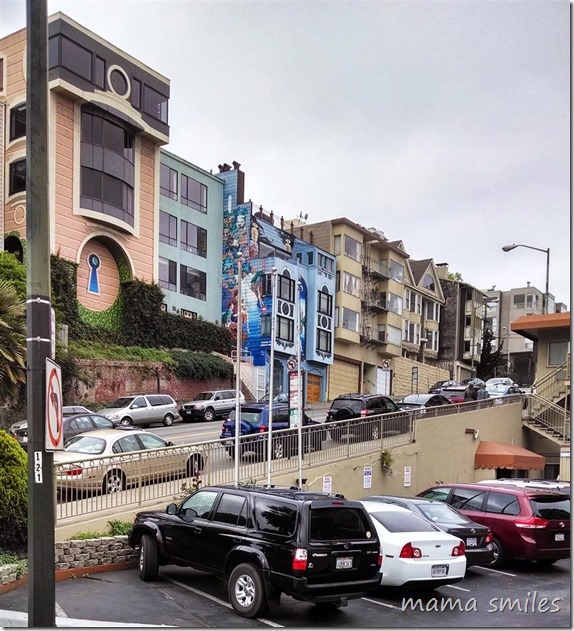 San Francisco is famous for attracting artists, and it’s no surprise given the creativity that goes into local buildings! If you look closely at the building at the top left of the photo above you will see that they painted the windows on the side of the building to look like bay windows, but they are actually flush against the building. It’s an optical illusion created to match the real bay window on the front of the building! 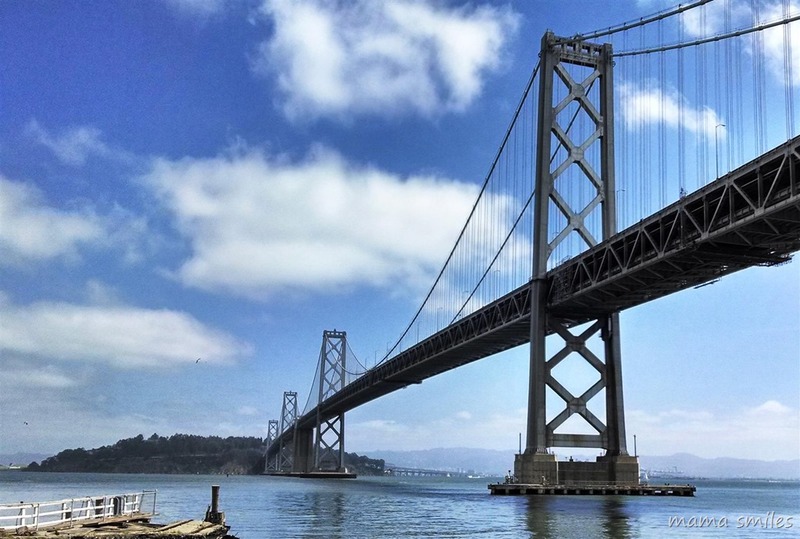 I’m a big fan of neat bridges, and the Bay Bridge is a very nice one! 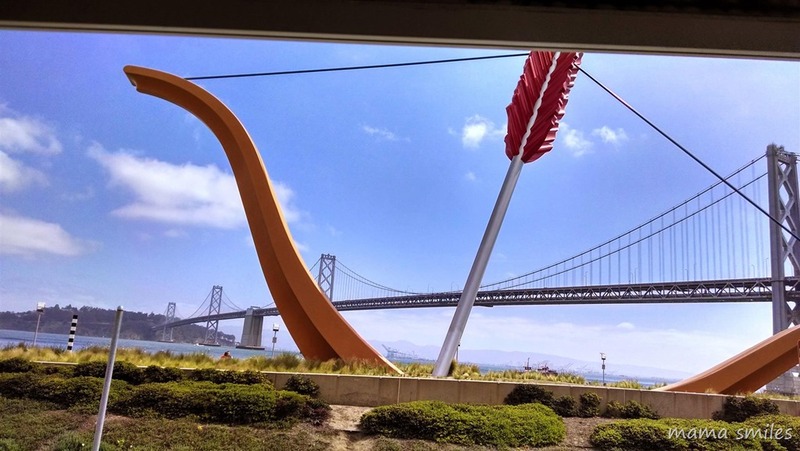 An artist was commissioned to create whatever they wanted for the sculpture below, and they built cupid’s bow and arrow because they felt so much love in San Francisco. 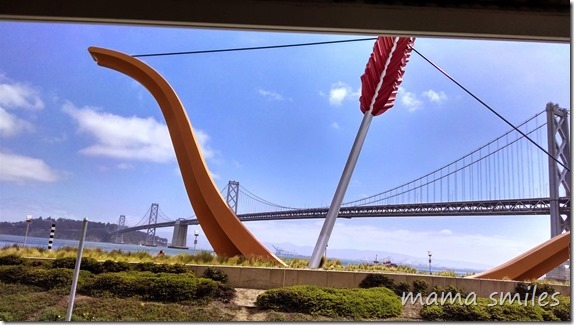 That bow and arrow is for one BIG cupid! 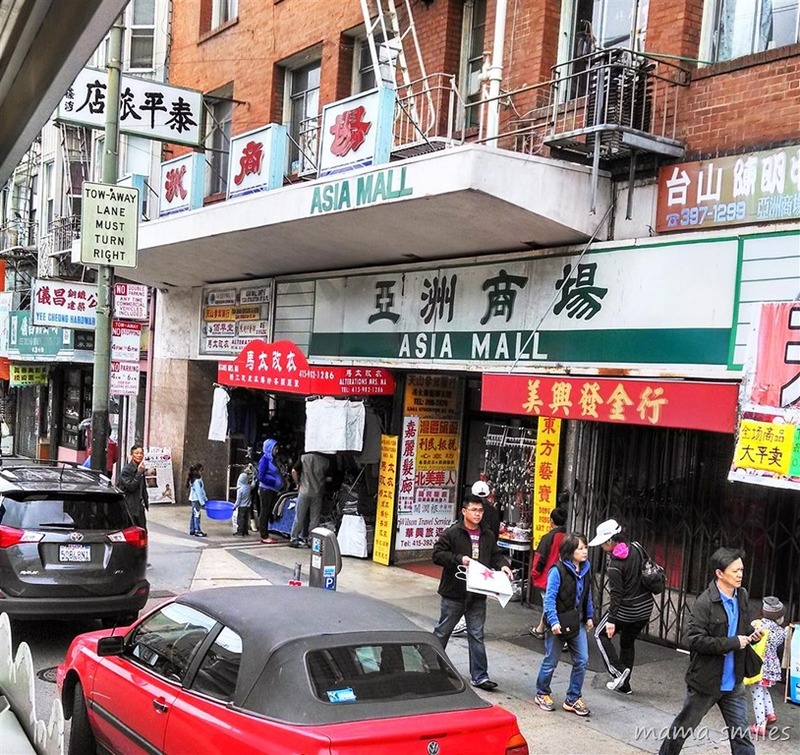 China town is probably my favorite part of San Francisco. 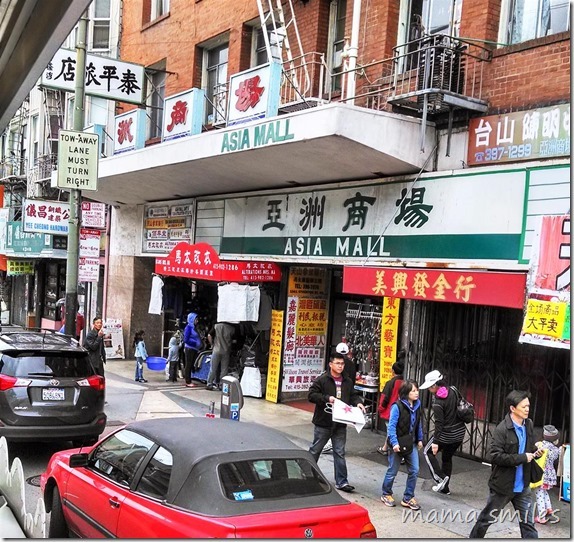 My kids got their first introduction to this part of town on our duck tour, and I look forward to taking them there for dim sum, although I think I’ll wait until they are a little older. No tour of San Francisco is complete without your classic San Francisco image of a cable car on a hill! We were lucky enough to drive past this street in time for a postcard perfect photo opportunity! Four-year-old Lily fell in love with the cable cars! Our Ride the Ducks tour was such a great way to introduce the kids to San Francisco! Big cities can be overwhelming for little ones, and this was a wonderful way for them to get a feel for the city without going into sensory overload. Our tour guide shared several interesting facts about the city, as well as silly jokes interspersed with relevant sound clips from popular songs. This was our favorite: Did you know what seagulls are called in San Francisco? Bagels (Bay gulls)! Thank you, Ride the Ducks, for this fun introduction to the beautiful city of San Francisco! Do you live near San Francisco, or do you plan to visit? If so, you’ll want to enter this giveaway! Have you ever gone on a DUKW tour? Do you have a favorite tip about traveling with kids to share? Great fun, can’t wait to ride em again! It’s such a great way to see the city! Wow, this is a fun giveaway. Perhaps we will get lucky, I am sure Smarty would enjoy the ride, especially in this weather. Our favorite touristy thing to do is to explore the museums, especially the kid-friendly museums and also visit zoos. Good luck! We need to visit the local museums and zoos, but so far our weekends are always jam-packed. Maybe that will be what we will do all summer? And, as a PS, your photos are beautiful. It must have been a great day! Thank you! We got PERFECT weather! I would love to go someday…it’s on my travel bucket list…we just never go west …except to AZ to see family! Let me know if you do make it out here – it would be so fun to meet up! We rode the ducks in Boston. It’s one of our favorite memories. It was on my to-do list for Boston, but it never happened. We really enjoyed the experience in San Francisco, and will definitely go for it whenever we make it back to Boston with the kids! Such a fun family experience! I’ve never been to San Francisco but the Golden Gate Bridge has always been intriguing to me. It’s a beautiful bridge, and although we didn’t see it on this tour the kids have driven across it with us. I’ll have to get some great pictures of it sometime to share. We “rode the ducks” up in Wisconsin, and there’s one here in Austin, but we haven’t tried it yet. They sure are a lot of fun to do though. I have been to San Francisco a number of times but all pre-marriage and kids. I really enjoyed doing the very touristy drive down Lombard Street. I would love to visit with my family one day – it is an incredible city and this sounds like the perfect way to see it with children. We love exploring the local food especially ethnic food and dive restaurants! 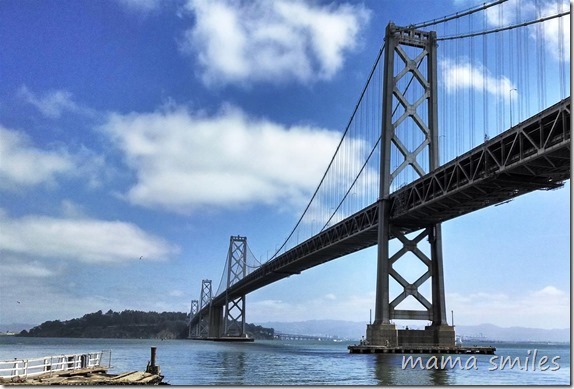 We honeymooned in San Fran, so it’s a very special place for us! 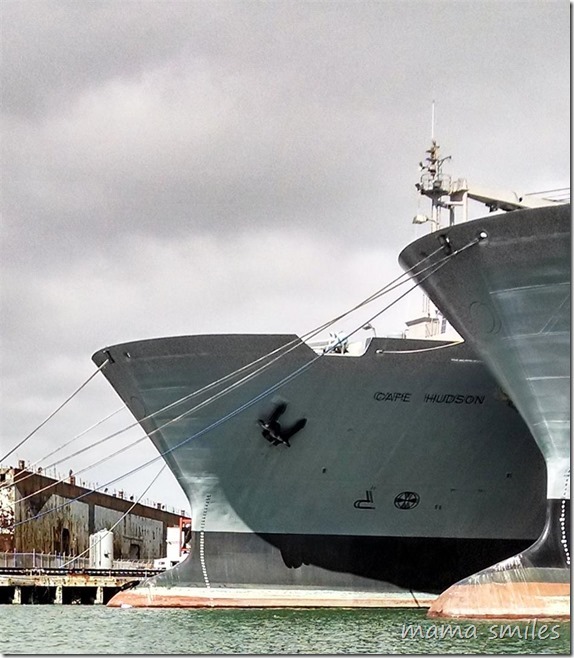 :) Great pictures and I love how you pointed out the sea lion and optical illusion windows. The only place I have seen duck boat tours is London; I’ve never been on one but they look fun! We recently moved to the area but haven’t taken our kidlets to San Fran quite yet. We haven’t done much traveling with our kids as they are pretty young, but our favorite touristy type thing we like to do is to go to the zoo. 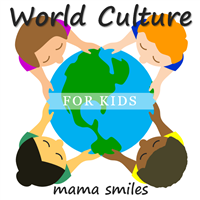 Travel tips would be to talk to your kids well about it before and get them excited about the travel process being part of the fun. You can NEVER have too many snacks! I love all things touristy. I take photos posing just like statues, eat the local food, and buy the tshirt! My favorite toursity thing to do with kids in SF is to go to Pier 39! My kids LOVE Trouble Coffee and Coconut Club, too! We love to go to the Monterrey Bay Aquarium with the kids! This would be wonderful! We just moved to the San Francisco area and would love to take my daughter to see the sights! We love doing as the locals do, sampling all the local fares (San Fran has some amazing food! ), and taking lots of pictures to remember the trip! I like to visit the wineries. I love San Francisco. There’s always something new to see and a new way to see it. Dave has been traveling to CA a lot for work and we have the opportunity to go to San Francisco with him in July. I’m not sure I want to pay for airfare for me and Abby, but the hotel and car would be free. Anyway, CA has never been a place I’ve wanted to go, but Dave wants us to see it. Anywhere else in San Francisco you’d recommend? We love doing anything where the kids can get out and run around especially since we are in a city! We haven’t really traveled much with my son, so I don’t have any tips.